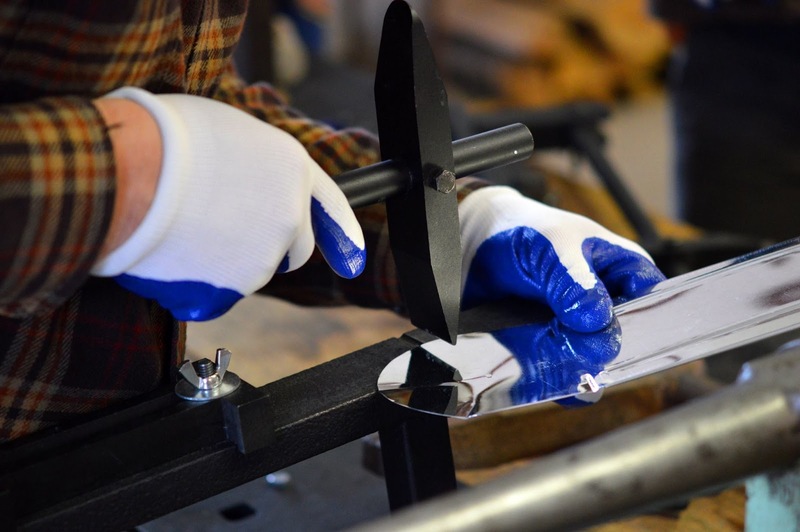 Please check out the March program page for info on this weekend's activities on the Trails of History. Erie Maritime Museum recently debuted its first traveling STEM exhibit. Using this series of simple machines, a student can both feel and measure the mechanical advantage gained with the addition of pulleys. The Museum’s design elements are unique – students lift 12-pound cannon balls using a rig constructed with a maritime feel: proper ship’s blocks and hempex lines secured to a rail of belaying pins. 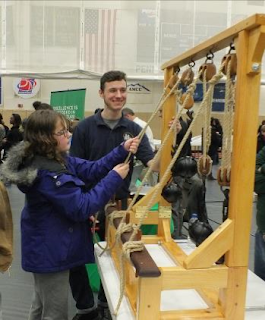 The exhibit was designed to be easily portable, constructed and rigged by Museum volunteer docents, who also field tested it at Penn State Behrend’s Family STEM Night last month. 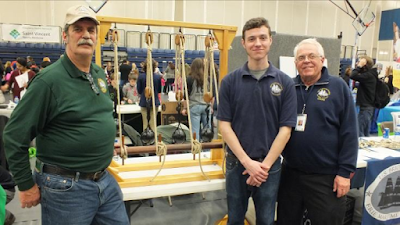 Lesson plans and an assembly/safety manual were drafted by Museum Intern Brett Eckstrom, a PSU Behrend History Major in his junior year. Brett will also train museum docents to deliver the lesson this term. So after mostly dodging the past several nor'easters, central PA got socked on the second day of spring. 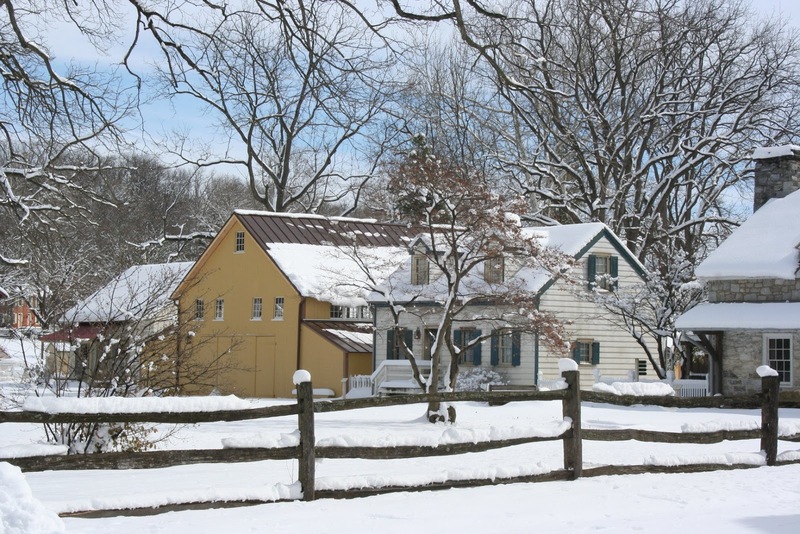 While other parts of the state have been hit with some of the earlier storms (and this one as well), Storm Toby was the Harrisburg area's first really serious brush with snow this winter. 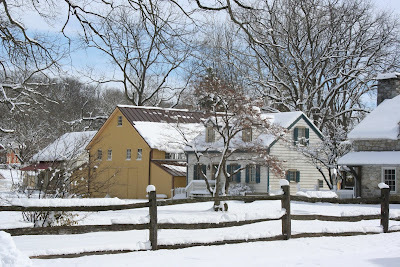 Landis Valley Village and Farm Museum posted some lovely after-storm photos (see below and visit their Facebook page for more). As a suggested means of whiling away a snow day, Landis Valley also posted a chocolate cake recipe from the Landis Valley Cookbook (p. 86) and media assistant Shayla Carey posted her video of preparing the cake. Don't watch it if you're hungry! Bushy Run Battlefield posted a time-lapse video of staff and volunteers changing the period uniform on a mannequin in the visitor center exhibit (watch below or on YouTube). Bushy Run had a very successful Charter Day, but is not actually open for the 2018 season until Wednesday, April 18. In the meantime, they are getting ready for visitors. 1857 - Elisha Otis installed the first modern passenger elevator in a public building. 1903 - The Wright brothers obtained an airplane patent. 1965 - America's first two-person space flight took off from Cape Kennedy with astronauts Virgil I. Grissom and John W. Young aboard. The craft was the Gemini 3. 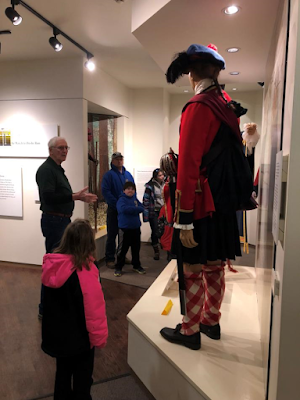 Please be sure to check the March program page if you're looking for things to do this weekend on the Trails of History. Last week's post in honor of Women's History Month, prompted staff at the Pennsylvania Military Museum to remind me of one of my favorite stories. I mentioned in last week's post that we are working on new exhibits at the Military Museum that will include the evolving roles of women in the military. 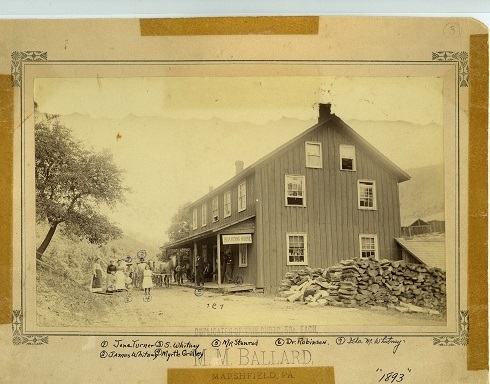 The exhibits will also explore the home front - the wartime roles of civilians and families in Pennsylvania as well as Pennsylvania industries. 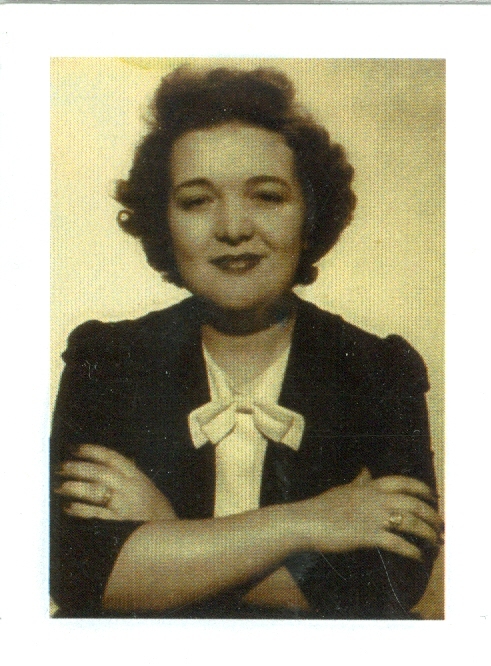 Ruth McDaniel Davis was newly married when her husband went off to fight in World War II. She went to work for the USO and volunteered for the American Red Cross. Like many women and girls on the home front, she knitted hats, gloves, and socks for soldiers (I remember my grandmother talking about knitting socks during World War I). 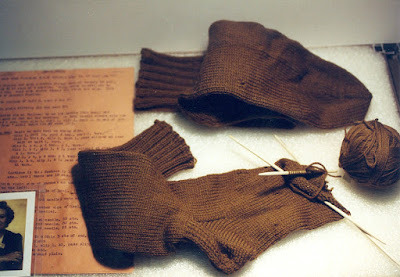 In the 1990s, while helping Ruth pack up her house, her son found a bag with knitting instructions, needles and yarn, one completed sock, and one still on double-pointed needles (see photo above). He asked his mother why she didn't finish the second sock--she replied, "The war ended." She put the socks aside and went about the business of post-war life. 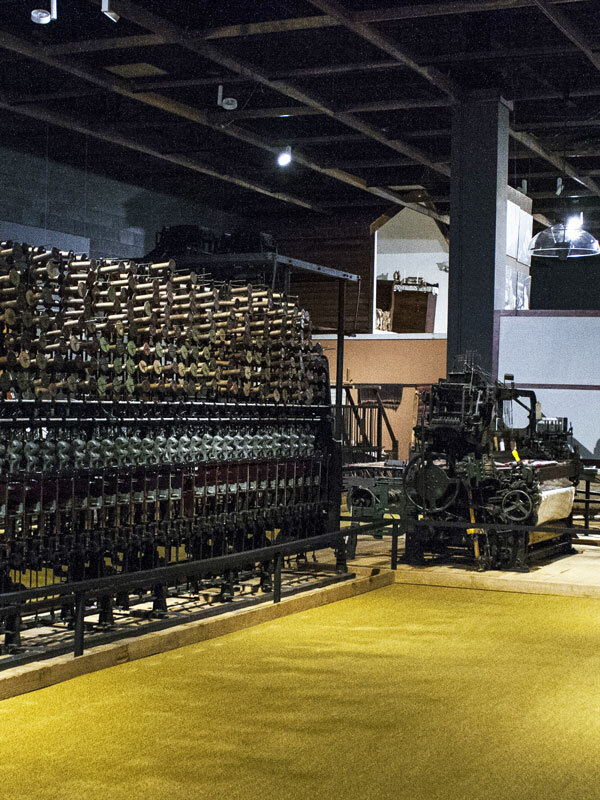 The socks, yarn, needles, and instructions are now part of the Military Museum collections and are exhibited periodically. 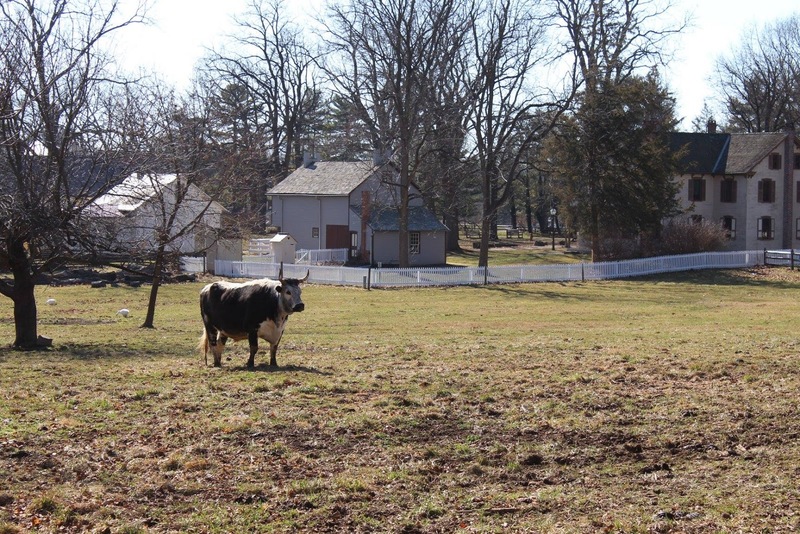 As you probably know, every year on the second Sunday in March, sites on the Pennsylvania Trails of History mark the Commonwealth's birthday and celebrate the 1681 Charter that granted William Penn the land that became Pennsylvania. 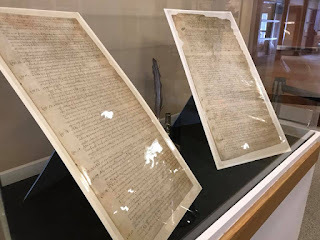 At The State Museum of Pennsylvania, the four-page original Charter goes on display for about a week and then returns to its special place in the Pennsylvania State Archives (see video of the Charter being brought out for exhibit). (The rest of the year, visitors to see a high-quality photographic reproduction of the Charter.) This year's "guest documents" were four Indian deeds by which land was given to William Penn and his heirs. At Pennsbury Manor, 2018 marks the 300th anniversary of William Penn's death and staff will be particularly focused on Penn's legacy. For Charter Day, Pennsbury displayed a 1682 manuscript of "The Great Law," Pennsylvania's first governing document (read more in this Courier Times article.) The six-page manuscript will be on display through Tuesday, March 20, so there's time to stop by this weekend. Most sites on the Pennsylvania Trails of History were open free of charge on March 11 for Charter Day. 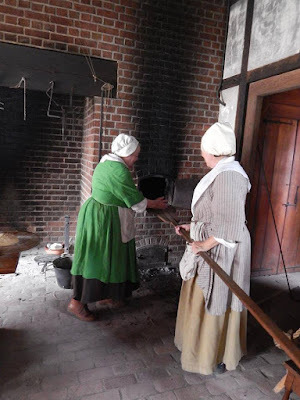 You can find photos on Facebook of activities at Bushy Run Battlefield, Conrad Weiser Homestead, Ephrata Cloister, Hope Lodge, and Joseph Priestley House (I'll add others as I find them or visit your favorite site on Facebook to check). Please check the March program page for info on events this weekend, including Charter Day (Sunday, March 11). Don't forget to set your clocks ahead one hour by 2 am Sunday (that is, the ones that don't do it themselves, cackling away like an Amazon Echo). We're part way through Women's History Month, and yesterday (March 8) was International Women's Day, so this seems like a good time to take a look at women's history on and around the Trails of History (of course, anytime is a good time to look at all kinds of history). What follows is a series of "snapshots," not a comprehensive list of women's history as interpreted at our sites. While the history of the lumber industry in Pennsylvania has been dominated by men, the exhibits at the Pennsylvania Lumber Museum do include women and their role in logging and in the conservation movement. Efforts to add more women's history are ongoing (such as this story posted on Facebook). 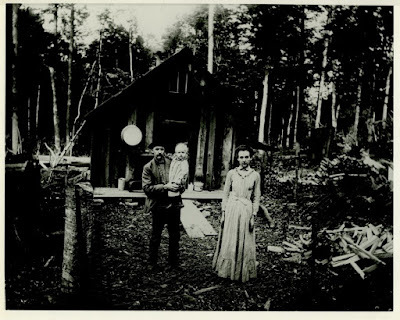 The photo above shows a logging camp foreman or jobber with his wife and daughter; women were present in the camps with their families and sometimes as cooks. The photo below shows a boarding house in Leetonia, one of the lumber towns featured in the museum's core exhibit. 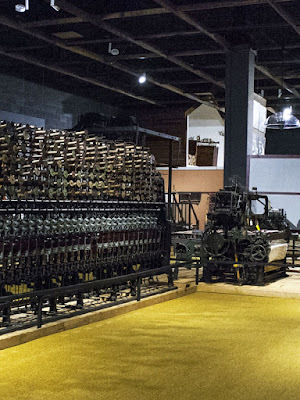 In addition to interpreting the lives and work of anthracite coal miners, the Anthracite Heritage Museum also explores the textile industry, which employed women in lace factories and as garment workers. Pennsbury Manor's interpretation includes the lives of Gulielma Springett Penn (1644-1694) and Hannah Callowhill Penn (1671-1726), including their roles in supporting and sustaining William Penn's Holy Experiment (read more about Hannah and see a portrait in Pennsbury's International Women's Day Facebook post). The work of other women at Pennsbury, both enslaved, indentured, and free, is also an important part of the programming and exhibits at the site. Military reenactment and timeline programs at the Pennsylvania Military Museum include the evolving roles of women in the military. 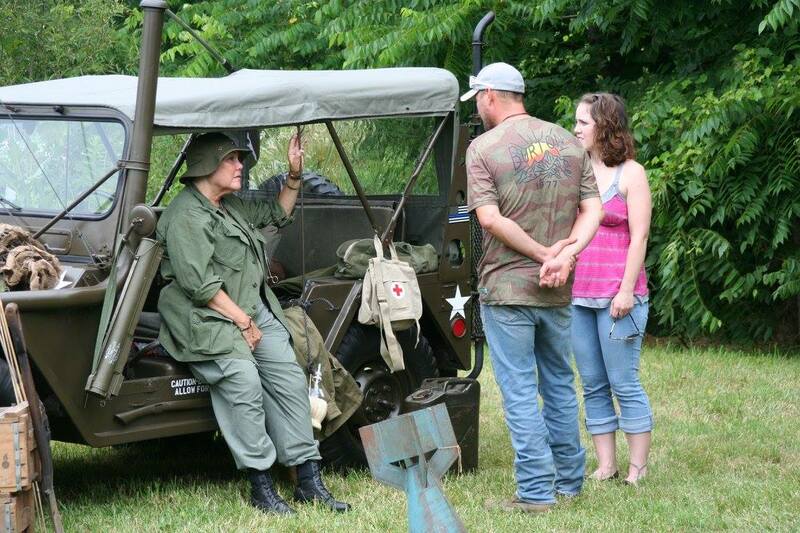 New interpretive exhibits currently in development will highlight the experiences of individuals in all branches of the military throughout the course of Pennsylvania history and include women serving on the home front and in conflict zones. Curious as to how many PHMC Historical Markers feature women or issues related to women's history? I was too, so I did a quick search and downloaded a list. Check it out. The New York Times announced a project to publish obituaries for notable women whose passing was ignored in its pages at the time of their deaths. The first 15 obituaries in the "Overlooked" project include Ida B. Wells, Ada Lovelace, and Emily Warren Roebling (read all 15 and learn more about the project, including how to nominate a woman for inclusion). National History Day has posted a preview of a larger project, "Women in American History," which provides resources for teachers to integrate women's history into their classes and encourage students to examine primary sources from colonial America to the present. Materials are available to download. In honor of Women's History Month, Governor Tom Wolf's Facebook page features a video highlighting women who have made significant contributions to Pennsylvania and beyond (view the video). The March program page is now up and running. I've highlighted some of this weekend's events below. February ended with a taste of spring, but it looks like March will hit us with another blast of winter. [UPDATE: Erie Maritime Museum is closed today, March 2, due to the weather. Be sure to check ahead at any site if the weather in your area is looking bad.] Why does that always take me by surprise? Nevertheless, I enjoyed the warmth and seeing early spring views on Facebook, like the ones Landis Valley Village and Farm Museum shared earlier this week (see more like the photo above on Landis Valley's Facebook page). Now that it's March, it's also Women's History Month. We'll keep you posted on women's history events on the Trails of History, and much of the ongoing interpretation at sites features women's work and their roles in their communities. In the meantime, the Smithsonian's National Museum of American History blog this week featured a photo array of women's clothing that exemplifies a wide range of work roles for women through time. Worth a look, I think. March 3: Pancake Breakfast—the Flagship Niagara League will host a pancake breakfast at Burch Farms Country Market in North East, PA. Cost is $7 per person and a portion of the proceeds supports the League's programs. Tickets are available ahead of time (see FB event page for details and menu). 7-11 am. March 3: Winter Learning for Adults—Scratched Eggs and Blacksmithing (not together). Information and online registration are available on the website. 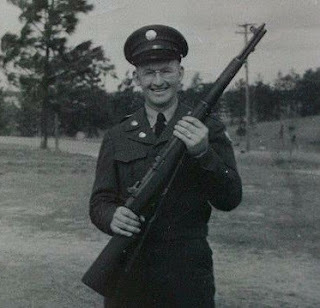 March 4: Friends' Lecture Series—James M. Wilson will recount his experiences in the U.S. Army in an illustrated talk entitled “Drafted into the Korean War.” 2-3 pm. March 2: Storytime—visit Village Square to learn about kitchens of the past, make pretend pancakes, and enjoy a reading of Tomie dePaola's Pancakes for Breakfast. Included in general admission. 10-11 am. 1874 - The batter's box (brief definition) is officially adopted by the National Association of Professional Base Ball Players (more than you ever wanted to know, about anything). 1918 - The New York Yankees purchase the contract of 1st baseman George Burns from the Detroit Tigers and immediately trade him to the Philadelphia Athletics. 1962 - Playing for the Philadelphia Warriors basketball team, Wilt Chamberlain scores 100 points against the New York Knicks (there is a PHMC historical marker commemorating Chamberlain, who was born in Philadelphia).